Zimbabwe's first lady Grace Mugabe (file photo). 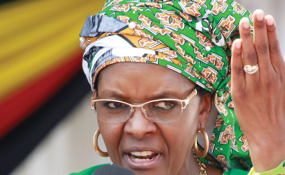 Grace Mugabe Tuesday filed a $1 230 000 lawsuit at the High Court in Harare against Jamal Joseph Ahmed saying the Lebanese failed to deliver a diamond ring she ordered from him, the state media reports. Wilson Tatenda Manase of Manase and Manase Legal Practitioners is representing the First Lady in the case. Ahmed, who holds a Zimbabwean residence permit, is into diamond-cutting, polishing and selling. Mugabe's wife says in April 2016 she ordered a 100-carat special ring worth $1 350 000 for her wedding anniversary from Ahmed and paid in advance through her CBZ Bank account. According to Mugabe's wife, Ahmed failed to deliver the ring and only paid $120 000. She claims that Ahmed became evasive and was unseen for some time only to supply a ring of far lesser value after being put under pressure. In papers filed at the High Court Tuesday, Grace is demanding the remaining debt of $1 230 000 plus interest calculated from April 1, 2015 to the date of payment in full. According to the suit, Grace wants the court to declare Ahmed's shareholding in three companies Thatchfree Investments, Zulaf Investments and Super Earth Properties -- executable. She also wants to attach his immovable properties in Avondale and Vainona, Harare, if he fails to settle the debt. "The plaintiff wanted to purchase a unique diamond ring for her wedding anniversary celebrations. The parties agreed that the diamond ring would be at least 100 carats and the agreed price was US$1 350 000. The plaintiff duly instructed her bankers, CBZ Bank, to transfer the money into defendant's bank account, to which the bank duly complied," reads the declaration. "In response, the defendant tendered a diamond ring worth US$30 000 and naturally, the plaintiff refused to take possession of an inferior ring," the declaration reads. Mr Ahmed later agreed to pay back the $1 350 000 that had been advanced to him, and he only paid $120 000. "Despite repeated demand, the defendant has neglected and failed to refund the full amount. The plaintiff has no other remedy but to seek redress from this very Honourable Court," the court papers reportedly read. The diamond saga first became public when she filed an affidavit opposing a High Court order granted by Justice Clemence Phiri in December 2016 ordering Grace and her proxies to vacate Ahmed's three Harare properties they had allegedly occupied. The First Lady said she did not invade anyone's premises, instead, she was a victim of a person she described as an "international fraudster wanted by the international police". Grace denied grabbing Ahmed's properties and that she used her status to force her way. Ahmed dragged Grace to court after she allegedly grabbed his three properties demanding a full refund for the ring. In approaching the court, Ahmed was also seeking protection from Grace's son, Russell Goreraza, son-in-law and Kennedy Fero, who, according to court papers, is part of the First Lady's security personnel. In his papers through lawyer Beatrice Mtetwa, Ahmed had alleged that he was afraid to come to Zimbabwe as he was being threatened.